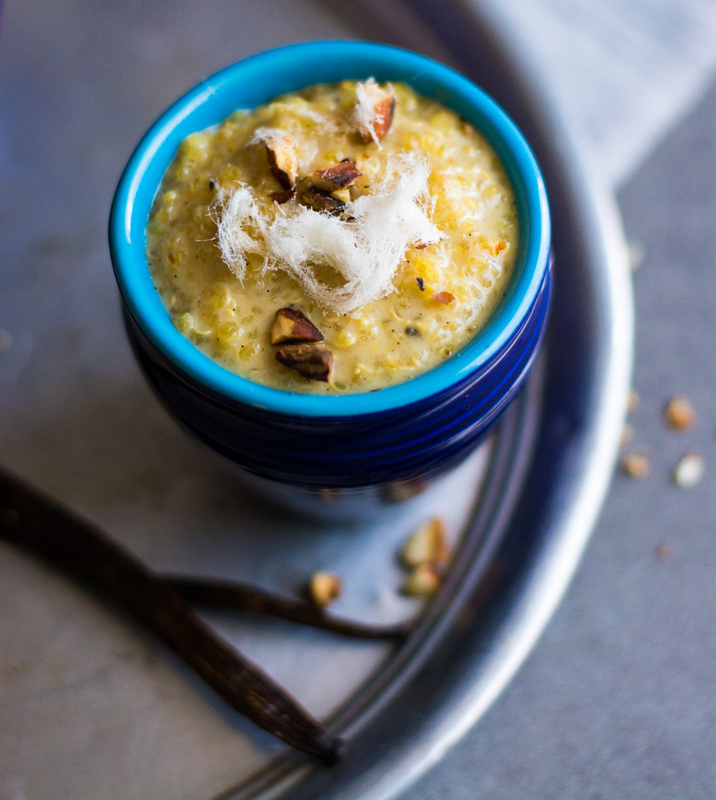 Diwali, Coconut & Quinoa Kheer and Win Flights to India! Of all of the stories that are associated with Diwali, the tale of Lord Rama, his wife Sita and brother Lakshman has to be the one that is dearest to my heart. It is a tale of honour, exile, self-control and eventually, triumph. This part of the epic Ramayana begins with the self-imposed exile of Rama after an administration bungle involving his stepmother and the throne. Despite the pleas of his father the King, honour drives Rama into the forest, where he is willingly followed by Sita and Lakshman to begin what is to be an adventure-filled, fourteen year camping trip. And what of Sita? Her adoptive father, also a King, discovered baby Sita in the fields (one assumes she was discovered by one of his staff as what King would toil the fields?). He is delighted with his find, which if you ask me is a refreshing change in the attitude of that time, when female babies were generally considered a consolation prize to sons. He raises her as his own and when she is of marriageable age, hosts the equivalent of a celestial weight lifting championship to filter out the men from the mice. Thus, Rama is found. He is known in Hindu mythology as Purushottama, literally the Supreme Being, or Perfect Man (thereby confirming that on Earth, one may find Mr. Right but can forget any hopes of finding Mr. Perfect). So after having to suffer through watching keen suitor after keen suitor attempt to lift the heaviest bow in the world, the Princess Sita finds her perfect man, marries him and is rewarded with a honeymoon of more than a decade in the woods with no mobile phone connection and barely a hairdryer to her name. As if having to wander around in the forest with your husband and the third wheel his brother wasn’t trying enough for the poor lady, she manages to get herself kidnapped by Ravana, an obnoxious demon with appalling table manners. So Diwali marks the return from exile of the trio, after Rama proves his perfection by slaying the evil Ravana, rescuing his wife and bringing her back to civilisation before she can get herself into any more trouble. Known as the Festival of Lights, an important feature of Diwali is the lighting of lamps and of firecrackers. The flames and bursts are a symbol of good triumphing over evil, of light obscuring the darkness. In Sydney, the law dictates that we be content with the lighting of sparklers and of small oil filled lamps, or diyas. When I was in Mumbai as a child however, it was a different story. Weeks before the much anticipated festival, we would stock up on firecrackers of all shapes, sizes and colours. Then the day would come and after the religious rituals were duly observed and obscene amounts of food eaten, all of the inhabitants would gather in front of the apartment block, the youngest kids hoisted safely onto their fathers’ shoulders. We would often start softly, with flower pots that would spray a bouquet of light upwards and chakkars (wheels) that would spin madly when lit, spraying colourful sparks unpredictably in all directions. Some of the braver boys would venture onto rockets, placing them in used soda bottles. These had to be lit quickly, legs in take-off position, so that the mad dash to safety could be done before they launched. The grand finale would be strings of tiny ‘Dum Dum’ crackers, named so for the deafening cavalcade of explosions that began when they were lit, leaving ears ringing till Christmas. When the boxes of firecrackers had all been systematically reduced to burnt paper and the air was heavy with the strangely intoxicating scent of over-done popcorn, we would all head back into our homes (or each others’) to enjoy a vast array of sweets for dessert. Firecrackers and sweets jostle for first place among the highlights of Diwali and in Australia, where the law is limiting, sweets win every time. There are no rules against sugary, milky gratification and indulge we do, with at least three different types of sweets every year. 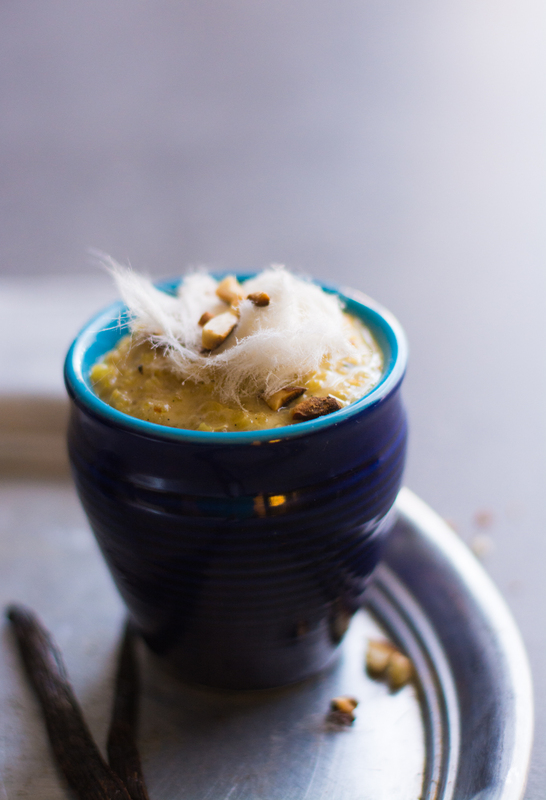 This year, I played with a variation on kheer, a popular condensed milk and rice pudding. In this version, the quinoa lends a nuttiness which cuts through its creamy, mildly sweet coconut vehicle. There is a pleasant coating of the tongue of thickened coconut milk and the delicate balance of the cardamom, saffron and vanilla that it carries. Jaggery lends a warm, caramel sweetness, but you could use brown sugar if you don’t have any on hand. An abundant drizzle of toasted, crushed nuts is mandatory and gives the molars something to work on in an otherwise soft world. I chose almonds and also used some Persian fairy floss that I happened to find strutting around in the pantry. From a nutrition perspective, quinoa is mostly protein and therefore a healthier option to rice. Also, the natural sweetness of coconut products means that only a small amount of sweetener is required. Serve in small bowls, as both quinoa and coconut milk are filling entities and the last thing we all need is dessert fatigue*. 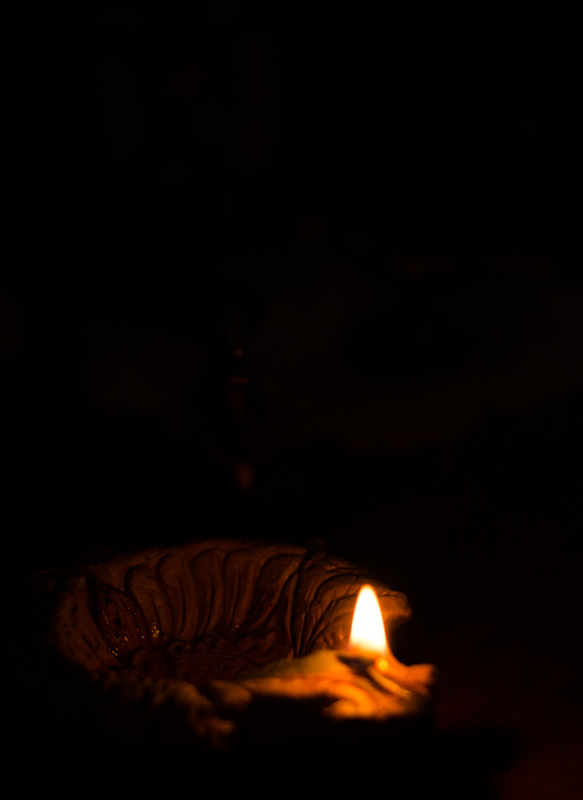 So whether your Diwali consists of Dum-Dums and squealing children, or quiet rituals and too much food, may it be filled with light, love and sweetness. Happy Diwali! Looking for other eggless sweet options? Try these chocolate burfi. or this raw mint slice, or these truffles or these ones. This is a sponsored post, but words, opinions and ramblings are my own. Boil the quinoa in plenty of water for 6-8 mins. Drain and rinse the quinoa well. 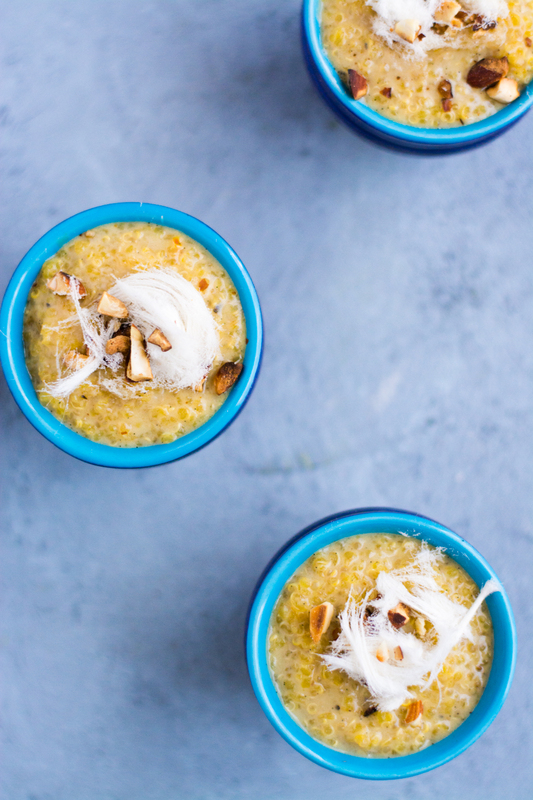 In a heavy-bottomed saucepan, place the drained quinoa, coconut milk, coconut cream, powdered jaggery or brown sugar, powdered cardamom seeds and saffron. Split the vanilla bean and scrape out the seeds. Place the seeds and the bean into the pan. Bring gently to the boil, then lower the heat and simmer gently for 20-30 minutes, stirring every few minutes, until the pudding has thickened to a porridge consistency. Crush and toast the nuts in another pan while this is happening. Serve topped with crushed nuts and whatever else happens to be serving a purely decorative purpose in your pantry. *We all know dessert fatigue is a myth, but the weak amongst us claim it exists. Also, I may have made way too much of this and eaten it for breakfast 3 days in a row. Jaggery is an unrefined Indian brown sugar that you can pick up at Indian grocery stores. If you don’t have vanilla beans, you can substitute with vanilla extract or paste. ive recently taken a liking for anything with caramom! It’s good stuff Amy but a strong flavour so start with small amounts if you are not used to cooking with it! Happy Deepavali to you too. I am sure even Lord Rama and Sita will be giggling when they read your Narration like I am doing on the train. Will certainly try it out. Love all jaggery based sweets. Thanks and Happy Diwali to you too! They look like gorgeous little pots of deliciousness! Happy Diwali in advance 🙂 Loved your account of Diwali. Thise little pots of kheer look luscious! Is that candy floss on top? Thank you so much and Happy Diwali to you too! It’s Persian Fairy floss……I’ve been trying to get my hands on some for ages and the other day someone randomly gave me some! Hope you have a wonderfully delicious festival next week! 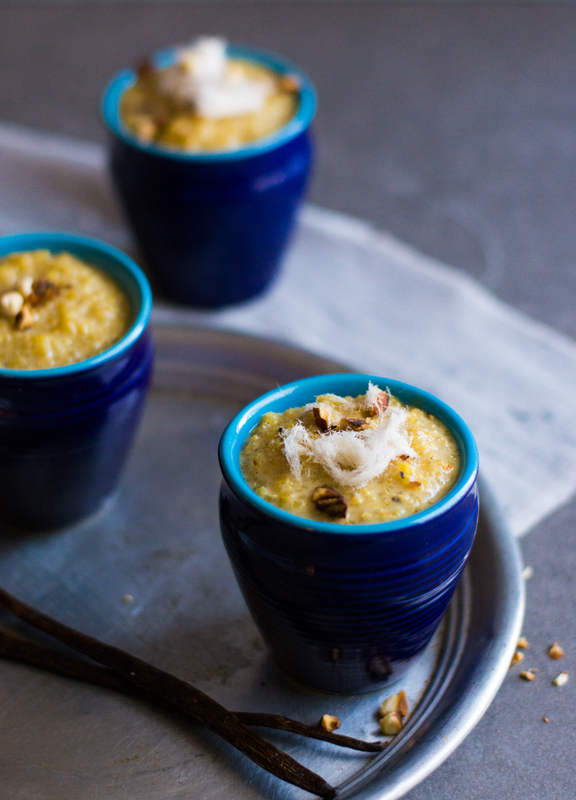 Your quinoa kheer is perfect! Thanks dear…..Happy Diwali and good luck for exams! !